For those of you who are big Tyler Henry fans…..good news! The new season of the smash hit “Hollywood Medium” TV show begins this week, with a whole slew of new celebrities, and skeptics, and spiritually uplifting stories that are guaranteed to inspire, entertain and puzzle in equal measure. A bunch of our readers saw Tyler in person this summer in Atlantic City, and a few who know him well say that he is the genuine article – uniquely gifted, uniquely talented, and unusually wise for such a young soul. For more on the new season of the Tyler Henry show, check out some of the great resources at the link below. Season three of Hollywood Medium with Tyler Henry kicks off on E! Feb. 28. The new season sees host Henry sit with Big Bang Theory star Jim Parsons as Parsons tries to connect with his deceased father, singer La Toya Jackson, actors David and Rosanna Arquette and rapper Iggy Azalea. Hollywood Medium with Tyler Henry is produced by 44 Blue Productions, a Red Arrow Studios company, and Corbett-Stern Productions in association with Mortar Media. Michael Corbett, Stephanie Noonan Drachkovitch, Larry Stern, Cameron Kadison and Sarah Skibitzke are the executive producers. Other celebrities appearing on Hollywood Medium this season are Kristin Cavallari, Guiliana Rancic and Taye Diggs. 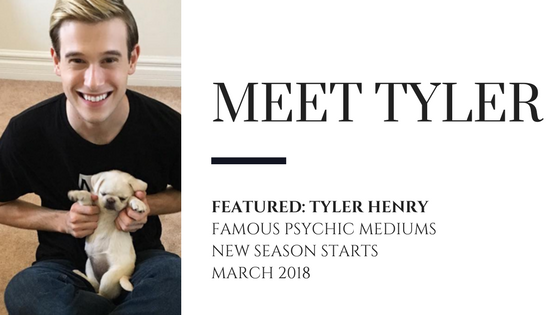 Tyler Henry Appointments and reviews.